Claiming asylum is an important human right backed by the United Nations Refugee Convention and recognised by countries around the world. In order to make this right a reality in practice, countries like the UK have set up systems by which people must apply for asylum. In this way, asylum seekers who are considered to meet the criteria for refugee status are separated from those who, in the view of government officials called caseworkers, do not qualify. In the United Kingdom, this is done by the Home Office, a government department. This article aims to gives readers a basic understanding of the process of claiming asylum. 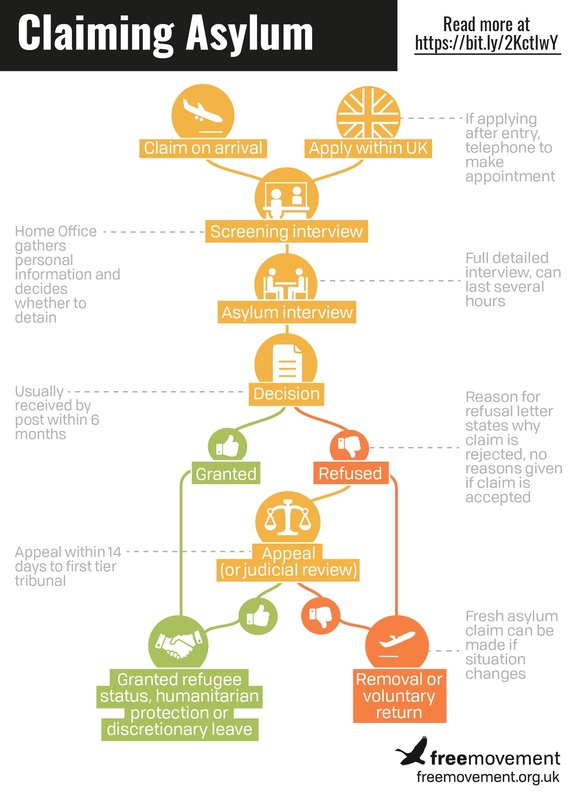 It is drawn from the Free Movement online training course Introduction to the UK asylum process, which expands on this article and includes worked examples. For the law on asylum claims, see our ebook on Refugee law in the UK. A person can claim asylum at the port of entry (for example, an airport or port) or once they have already entered the UK. Claiming asylum at the port of entry means, in practice, informing a Border Force officer of an intention to seek asylum. Border Force officers will usually be wearing blue uniforms with “Border Force” written on them. In practice, the border officers that people will encounter are those doing passport controls at the airport or port. One should simply let them know that they are afraid of returning to their country and want to claim asylum in the UK. When claiming asylum at the port of entry, individuals will usually be immediately asked questions about their claim, in the form of a “screening interview”. If the screening interview does not take place on the same day, it would usually take place within five days. If wishing to claim asylum after they have entered the UK, people must start by calling the Home Office to book an appointment at the Asylum Screening Unit. That will usually be set for between five and 15 days after the claimant made the initial telephone call. Screening interviews usually take place at Lunar House, in Croydon. Those who claim asylum in Northern Ireland will be invited to attend Bryson House, in Belfast. There is little privacy at Lunar House: the waiting area is open plan, and rooms where interviews take place are often only separated by a glass screen. It is sometimes possible to hear what happens in the next room. Claimants should attend their screening interview with evidence of identity (including their passport) and evidence of their accommodation in the UK (for example, a recent bank statement or utility bill, or a letter from the landlord). Claimants may also be told by the Home Office to attend the screening interview with evidence in support of their claim. At the screening interview, the Home Office will take claimants’ “biometric information”: that is, their fingerprints and photograph. The biometric information is used to verify the claimant’s identity, and also to issue their ARC (Application Registration Card). Here is the Home Office form used at a typical screening interview, showing the questions that will be asked. Where the screening officer has reason to believe that the claimant was an illegal entrant, they will often carry out a second interview, which will be an interview under caution. This means that what is said during the interview might be used against the claimant. Being declared an illegal entrant does not have an immediate impact on the asylum claim. If the claimant meets the definition of a refugee, they will still be granted status. But it might affect their immigration status in the future, including in an application for British citizenship. As the guidance on the “good character requirement” is currently drafted, an application for British citizenship by a person who has been declared an illegal entrant may be refused for ten years following the declaration of illegal entry. At the end of the screening interview, claimants will be given a copy of their screening records. These are written records of what they said during the interview. They will not be given copies of the records of the interview under caution, if that took place. Claimants will also usually be issued with a Section 120 One Stop Notice, on the day or by post after the screening interview. The One Stop Notice will look something like this. At the interview, the claimant will need to hand over their passport (if it is not already with the Home Office) and, if they have one, their Biometric Residence Permit. Claimants will be sent an Application Registration Card (ARC) instead, which will be their form of identity until the claim terminates. After the screening interview, asylum claimants or their representatives will receive a letter with the date, time and place of the substantive interview. This is what the letter might look like. The substantive interview involves questions about what happened to the claimant in the past, when, where, with whom etc. Interviewers will generally ask questions about documents which were submitted beforehand, to check that what the claimant says is consistent with the documents. When an inconsistency arises, interviewers should give the claimant an opportunity to explain it.In practice, when the Home Office is minded to refuse, inconsistencies will still be used to refuse claims even when explained. The interview is usually face to face. A typical interview room will be four to five square metres. It will have a rectangular table with chairs on each side. The interviewer will sit on one side, with a computer facing them, while the claimant will sit on the other side. If there is an interpreter, they will usually sit next to the Home Office interviewer. Legal representatives will sit next to or behind the claimant. Some people are now invited to have their interview via video conference. That means that the asylum seeker will be in a room with their representative facing a screen. When an interpreter is needed, they will also be video-linked. Interviews may last anywhere between one hour and six to seven hours (occasionally even longer), although the average length is about four hours. The interviewer will often schedule breaks every one or two hours. It is also possible for the claimant to ask for breaks if needed. This may be worth doing, as the interview process can be exhausting, with hundreds of questions asked. If a claimant starts feeling tired, confused, or upset, they should ask to take a break to start afresh rather than “powering through” and starting to get answers wrong. Legal representatives are allowed to attend the interview but they may not interrupt unless to draw attention to a serious misunderstanding between their client and the interviewer. A claimant also has the right to ask for an interpreter to assist during the interview. A claimant who needs an interpreter will usually have asked for it when they first claimed asylum, either at the port of entry or when calling the Home Office to book a screening interview. During that call, one of the questions the Home Office will ask is whether the claimant needs an interpreter. If a claimant says that they need an interpreter, an interpreter will be provided both at the screening interview and at the substantive interview. During the interview, the interviewer will be transcribing the questions and answers given at the interview. These can be hand-written notes although most interviews are typed these days. At the end of the substantive interview, claimants are given a copy of these written records. In practice, most interviews are audio recorded even where claimants are represented and indeed have their legal representatives with them at the interview. This will also be given to the claimant at this point on a USB stick. It is very important for claimants and their legal representatives to review the written records shortly after the interview. They will usually have five working days to make any comments on the records (for example, if some answers were not transcribed accurately or the claimant made a mistake that they want to rectify). If the Home Office is minded to refuse, it will often do so by relying on mistakes which might have been rectified. The fact that they were rectified earlier on boosts the credibility of the claimant at the appeal stage. The case of MM (unfairness; E & R) Sudan  UKUT 105 (IAC), discussed in this blog post, underscores the procedural importance of writing to the Home Office to correct the record. In those five working days, the claimant and their legal representatives can also submit any new evidence they may have in support of the claim. This is important because new matters which were not deemed to be important to the claimant might have arisen during the interview, and might need to be corroborated to boost the claimant’s credibility. If inconsistencies have arisen during the interview, and those inconsistencies may be “corrected” by submitting further evidence, that should also be encouraged. According to Home Office guidance, a decision on asylum claims should be taken within six months of the date the claim was first raised (which is usually taken to be the date of the screening interview rather than the date an asylum seeker calls the Home Office to claim asylum). In practice, the six-month timeline is not always respected and some claimants wait over a year before their claim is decided. If the claim is accepted, an asylum seeker will generally be granted five years’ refugee status. Refugees will be sent their decision letter by post along with any original documents submitted in support of the claim (although statements and letters of support are not usually returned). Sometimes, refugees also have their original passport sent back. As set out below, they should not use this or risk having their refugee status revoked. 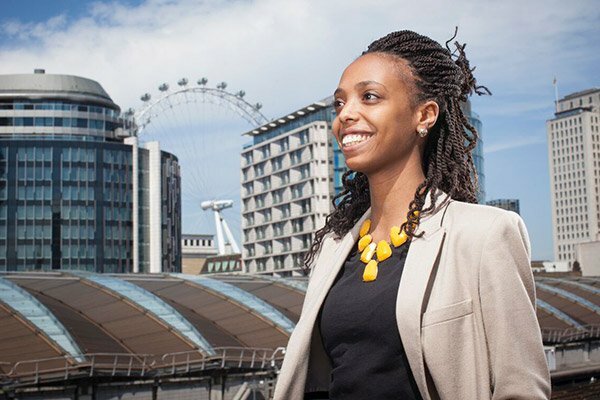 Successful asylum applicants are allowed to live, work and study in the UK, and access public funds. Information about claiming benefits is available from the Department for Work and Pensions and the charity Citizens’ Advice. Refugees may also apply for family reunion for family members, as set out in Part 11 of the Immigration Rules. More details are available in the Free Movement training course on family reunion. A successful refugee will be issued with a Biometric Residence Permit confirming their refugee status and their right to work in the UK. This document is usually enough to satisfy employers, landlords, banks and local authorities of the refugee’s status in the UK. However, to travel, refugees will need to obtain Travel Documents. A refugee should not use their national passport, as that might be seen by the Home Office as “re-availing themselves of the protection of their country of origin”, which is a ground for revocation of refugee status. For more information on this see the Home Office guidance here. To travel, refugees should instead apply for a Travel Document by using form TD112BRP. humanitarian protection, when a claimant does not qualify for protection under the Refugee Convention (if they will not be persecuted because of a “Convention reason”) but are still in need of international protection. For example, there might be a risk of serious harm if they return to their country of origin. As of February 2018, Libyan nationals are entitled to Humanitarian Protection but not all may be refugees. leave under the Immigration Rules, for example on human rights grounds, on the basis that they have a partner in the UK or there would be “very significant difficulties to their reintegration in their country of origin” (under paragraph 276ADE of the Immigration Rules). limited leave to remain outside of the rules until the applicant is 17.5 years old. This is typically granted to unaccompanied minors. discretionary leave for those who are recognised victims of trafficking and need to stay in the UK, for example because they are assisting the police with inquiries or are seen as particularly vulnerable. restricted leave for those who are excluded from the Refugee Convention, for example because they are war criminals, but removing them would breach their rights under Article 3 of the European Convention on Human Rights. discretionary leave for those who have a very serious medical condition which could not be treated in their country of origin. If refugee status is refused and no other leave is granted, then a claimant may be given a right of appeal or his claim may be certified. A claim may be certified when it is considered “clearly unfounded”. If a claim is certified, the asylum seeker may have a right of appeal but may only exercise it from outside the UK. When an asylum claim is refused there is usually a right of appeal and the appeal can usually be pursued from within the UK. Whether or not there is a right of appeal to a judge in the First-tier Tribunal is determined by law. Specifically, section 82 of the Nationality, Immigration and Asylum Act 2002 as amended says that there is a right of appeal in certain specific circumstances. For asylum claims, this is when “the Secretary of State has decided to refuse a protection claim made by P”, where “P” is the asylum seeker. A protection claim is defined in the section as a claim by the person that his or her removal from the UK would breach the Refugee Convention or the European Convention on Human Rights. Where the Home Office has considered and refused an asylum seeker’s asylum claim, this will almost always give rise to a right of appeal. The only exceptions to this might be if the asylum seeker has previously made an asylum claim which has already been rejected or is being put through the “Dublin” process and being removed to another EEA country in which he or she claimed asylum or was fingerprinted. The time limit for lodging an appeal is 14 days from the date of the decision. It is extremely important to get an appeal lodged within this time limit. It is possible for the tribunal to accept late notices of appeal. However, this is unusual and the tribunal will not usually accept reasons such as “I did not know there was a time limit” or “I do not speak English”. Where a notice of appeal is lodged late, an application to extend time must be included, very good reasons must be given and evidence to support those reasons should be enclosed. An appeal is lodged by completing form IAFT-5. The form and an accompanying guide on how to complete the form will usually be sent by the Home Office along with the refusal letter. The guide can also be found on the HM Courts and Tribunals website. Appeals can only be brought on the grounds set out in section 82 of the Nationality, Immigration and Asylum Act 2002. The Home Office has good guidance on rights of appeal, and readers may also refer to our ebook on the Immigration Act 2014. The grounds include that “the removal of the appellant from the UK would breach the UK’s obligations under the Refugee Convention”. This would typically be the ground to use in appealing against a refusal of an asylum claim. If an appeal to the First-tier Tribunal is dismissed, a further appeal to the Upper Tribunal can be attempted. Any further appeal needs permission to proceed, however, and can only be based on what is called an “error of law”. An error of law is some sort of legal error or mistake made by the judge. Simply disagreeing with or not liking the outcome is not an error of law. At each stage, an application for permission to appeal against the decision of the judge can be made at the level of the tribunal or court that made the decision and then, if that fails, to the next level up. If an asylum claim is certified, or has been refused and all appeal rights were exhausted, then a claimant may make further submissions. Once further submissions are submitted, the Home Office will need to decide whether they constitute a “fresh claim”. 2. taken together with the previously considered material, created a realistic prospect of success, notwithstanding its rejection. This paragraph does not apply to claims made overseas. decide that the new evidence does not constitute a fresh claim and refuse the application without a right of appeal. If further submissions are not accepted as a fresh claim, a claimant may judicially review the decision.